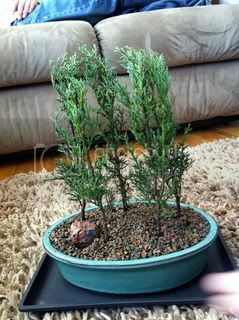 This is my Italian Cypress forest. 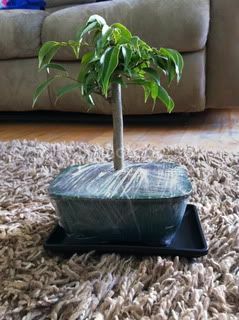 I'm slightly disappointed in the Ficus as the picture on the website I ordered it from showed a petite tree in a shallow round pot and the one I received just doesn't look much like it. Oh well still a cute little tree. My question is both the trees have gravel over the dirt. I honestly don't know what's even under it as I haven't messed with them yet. So should I remove the gravel? I got some moss spores that I planted in my other bonsai's and I would like to plant some in these but it's not possible with the rocks. i like the elm yo. It still has alot of growing to do. Are u going to keep it in such a small pot? Definitely get the gravel off the top of the soil if it is glued on. If it is not glued on it will not hurt anything, but you can remove it to plant moss. I've never understood why they glue gravel onto a plant's top soil level. Maybe it's to keep the soil from falling out during shipping? Is it there to look pretty? Who knows. Remove the glued on gravel because you'll never be able to tell if the soil underneath is getting adequate water. You can't check for soil moisture if you can't see the soil. By the way, Charles M., I love your youtube videos. It's good to relate to someone else more knowledgable in the southern California area. Maybe it's just me but is that really gravel? Is it really glued? Can you push the stones? 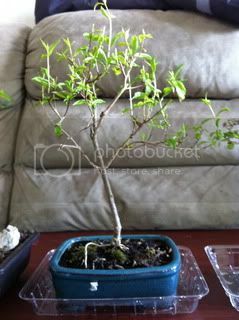 Also, I have a tree that looks like it has gravel glued but it's actually the soil it was planted in. 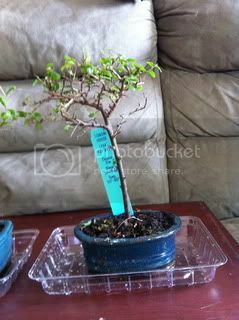 I've never seen a Chinese Elm like that.. looks like what they call (a stick in a pot). The Cypress Forest looks great especially with the rock.